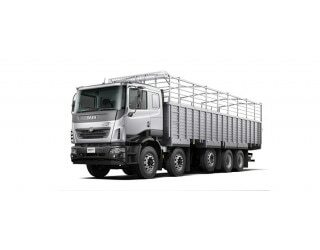 Nov 22, 2018: The Tata Prima LX 3718.T is one of best cargo carriers available from the indigenous automaker. It has a very heavy duty appearance and works just the same way as well. It is powered by the company’s tried-and-tested 5.9-litre BS-IV compliant engine that can make a maximum power of 177.1 bhp at 2,500 rpm along with a peak torque of 700 Nm at just 1,000 rpm. A 6-speed manual transmission gearbox does the duties of sending power to the wheels along with the assistance of a single plate dry-friction clutch. It has a really long wheelbase of 6,860 mm while having a gross vehicle weight of 37,000 kilograms. The sleeper cabin on the chassis gets air-conditioning as well. Air brakes are given along with the added benefits of ABS.